A correction. When I wrote this, I mentioned Shaun Horgan. There is no such person! There is a Sean Horgan, and he did call me yesterday to set the record straight. In addition to not spelling his name correctly, I was informed it was not he that deserved credit for my motivation. It belonged to someone else. This is where it began. My apologies Sean, and it was good talking to you. I’ve been meaning to write something about the not so new pay-wall that was erected to drive users to pay for access to the newly formatted Gloucester Daily Times online website that at one time was open accessed. Special thanks for the motivation belongs to Staff Writer Shaun Horgan. There is a trend taking shape in these publisher provided websites, but, as its been said, you can’t teach an old dog new tricks! You also can’t expect someone with a sheepskin in communications to really understand how or what makes the blogosphere tick unless they study what makes this communication tool successful. The easy assumption of the inexperienced corporate communications lackey, and those above them expecting earnings results utilizing paid access is, that if you erect a pay-wall they will pay and they will come! This attitude is sure to drive most people away, and that’s exactly what I’ve watched happen at a number of websites created by the dying print industry to a number of sites I’ve visited, like my local paper. What started out open access, they set a pay-wall in place and offered three articles for free, daily, which in reality is very generous, especially for people looking for specific material as is my case, commercial fishery articles. Even with the generous offering, traffic pooched and they did away with the limited entry and pay-wall all together. They learned something from their short lived experiment when they realized they were losing clicks. Clicks, hits, views, whatever you want to label traffic are the life blood of a digital venue, and without them there is death. Most importantly is what the visitors click on. The GDT has taken clicks to a new level unseen anywhere else! With the old format, an article was on one page, as it should be! These guys now have articles on multi pages, which of course, contributes greatly the clicks they receive. Pretty slick. Petty, and disingenuous if they use statistics to sell themselves to potential ad clients based on clicks. And they talk about NOAA fudging the books? Whoever is responsible for putting the GDT into a predicted tailspin must understand that the revenue that supports a website is ad clicks. Why in the world would a local vendor spend money to place an ad on a website with limited access? Charging what I’d be willing to bet is expensive ad space, then limiting the viewership is not a good deal for those that support you. Why would they bother? Where is the equity for them? They want the broadest reach possible. They want people from away to have visibility of their products and services. Gloucester is evolving as a tourist hub, now that the industry that built it is being slaughtered. Hotels, B&B’s, restaurants, and the little shops springing up will not be visible to those that get five puny clicks per month. Does anyone really believe a tourist is going to subscribe to the GDT when exploring online for these businesses wares and weekend events like the St. Peters festival, or Schooner Weekend? Of course the other ads you see but never click, generate about .30 -.35 cents per click. This ads up, and more people should click ads that interest them, or maybe you are in the market for whatever the ad is. Those clicks are what generates operating revenue. Lets face the fact that they won’t be around once the revenue dries up. Every website needs fuel to operate and revenue generated through clicks is fuel! Gotta keep the lights on, right? The GDT, and others, expect the locals will view a lot of the daily offerings, so they can expect a certain percentage from the community to subscribe. People not from the community will probably not subscribe to a venue to read about people not curbing their dogs in the park or such. They are not interested. The locals naturally would be, but not all of them. Because of the special content I seek to post and drive traffic to, I can gather enough from various sources to deliver a pretty damned good selection from all the fishery regions of the US and Canada. How many fish stories will a local carry? One or two a week maybe, depending on the location, or one per month? Most of us remember what a power house GDT was during the reign of our dear friend, Richard Gaines, encouraged and supported by Editor Ray Lamont, and the traffic generated from across the country and from around the wor ld. It was no less than of phenomenal, dynamic, exciting, award winning, alive! 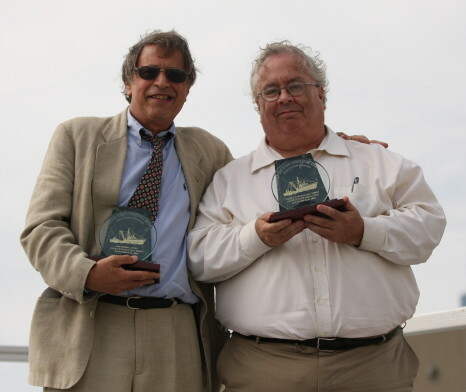 Gloucester Daily Times was our beacon of hope, receiving an honor bestowed upon them at New Bedford’s 2010 Working Waterfront weekend as the Offshore Mariners’ Wives “Friend of the Fishermen” award was presented to Richard. He considered this one of his finest moments, and we were so proud of him, and for them. I’d link the article, but I’m now locked out! I used up four of my monthly free clicks on one article, and used the last one to post the URL for the last article I posted. Besides, the article is probably now spread across six clicks. It was suggested to me by Mr. Horgan that I watch a video interview featuring Ray, (which I already had seen) explaining why I should subscribe, but then, the only one that could view the content would be me!, My viewers would only have access if they subscribed, so its pointless. They won’t do it. Many of them are fishermen who can’t afford more expenses, which is the focal point of many of GDT’s editorials. They should listen to themselves. We had the oars when we could use the tools that Richard, and Nancy too, had built for us to be the activists some of us had become, heralding the many injustices that the once Mighty Gloucester Daily Times exposed, and we shared to millions of people through the years around the country and the world. I can’t remember the acceptance speech verbatim that day, but Ironically, a quote stays with me today and everyday in a prominent spot on the website. It was about losing ground, but never giving up. We’re paddling with our hands.